Latest update 10 July 2015. We get up at 0700 after a very calm night, there is a bit of cloud this morning. Michael takes Veto to shore and then we have breakfast. We pull up anchor at 0755 and motorsail using the screecher and one engine. We are making 6 knots in 15 knots with half a knot current behind us. 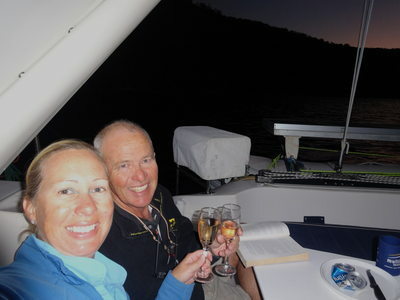 We are heading for Hamilton Island where we will pick up Ian and Sharon Gowan. They are from Port Macquarie in NSW and used to be from "The Shire" and were last on the boat when we came through Port in early May. 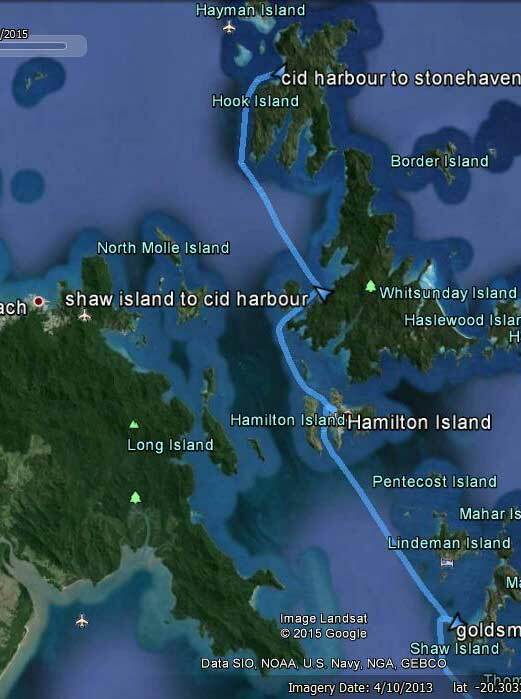 As we approach Hamilton Island there is a 1.5 to 2 knot current in the channel between it and Dent Island (luckily behind us). We have booked a one hour spot at the marina, the only way to be able to pick someone up. This costs $18. We have to hang around out front of the entrance for a while till the "concierges" come and get us. We follow them in and they show us the spot to tie up. It is a tight squeeze between two cats on a long wharf arm. They grab our lines and also advise what to do with the engines. We moor very easily at 1030! Ian and Sharon are there so we load all their stuff on board. We also take the opportunity to fill our water tanks and flush the watermaker (using this water). We have some morning tea and at 1140 reverse out of the spot and back out of the marina channel. We motor out and pull out the screecher again. 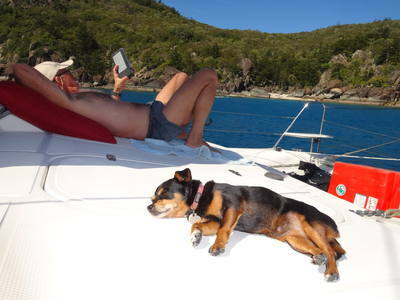 We sail till we get to the channel between Cid and Whitsunday Islands where the wind disappears. We motor the rest of the way and anchor in Sawmill Bay, Cid Harbour at 1310. We have lunch and then go ashore to Sawmill Beach. 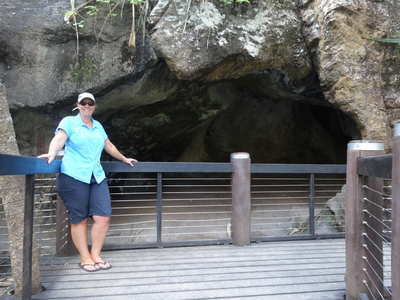 There are walks from here to Dugong Beach and to the summit where there is a lookout. Once back at the boat we all have a swim and Michael cleans the top part of the outside port hull that he never got to back at Lady Musgrave Island (over four weeks ago). The rest of the hulls appear not too bad, but the props are filthy, they will need some work. Today has been sunny for most of the day, one of the best days we have had this trip. We have sundowners and then Michael cooks a flat lamb on the barbecue and Kelly does vegies in the oven. There are now over 35 boats anchored here and it is very calm. It was again calm over night but at 0400 a bit of wind came up, but not too strong. We get up at 0800 and Michael and Ian take Veto to the beach. We have breakfast and at 0920 pull up the anchor. We motorsail as the wind is only 10 to 15 knots, but at times goes up to 22 knots. We are only doing 3.8 knots at times, but we do get up to 5.2 knots. We end up motoring the last little bit into Stonehaven Anchorage. We see a boat leaving a mooring just south of Anchor Point as we come in, so we head for that spot. We end up in what we think is the best mooring in the bay. We take Veto to the beach as it is now almost high tide and we will not be able go later when the tide is low. You cannot really anchor here as it is quite deep and closer to the shore there is a lot of coral (and it is prohibited as well). After lunch Kelly, Michael and Ian go for a dive while Sharon watches Veto and Catlypso. We drop off the back of the boat and swim over to the reef. It is 13 metres deep and we head north-west following the edge. The visibility is not great, perhaps five metres. There are lots of tropical species. There is not much hard coral, just soft coral and a few seawhips, but some are huge. Kelly also spots a very strange nudibranch that neither Michael nor Ian actually realises is a nudibranch. After 20 minutes we turn around and come back shallower, between 6 and 8 metres. This is much nicer, with lots more fish. We also see a large anemone which has dozens of glass shrimp (clear) in it. There are batfish and rainbow runners. There are a couple of snorkelers from the boat next to us on the reef and when we see them, Michael ascends to check if we are near the boat. We are, but it has turned 180 degrees and is hanging back away from us. Michael attempts to descend (the plan is to spend the next 15 minutes in this area) but he cannot as his right ear will not clear. In the end, Kelly and Ian ascend and we swim back to the boat on the surface. Michael fills the three tanks using the compressor (only 30 minutes) and then puts the generator on so we can make some rice and also top up the batteries. We only run it for 50 minutes. We have sundowners and then curry beef and rice for dinner. After dinner we listen to South Sydney play Penrith (could not get TV reception). Souths are hopeless and get beaten 20 to 6 (again confirming Michael's view they will not win the competition like they did last year). Later there is a really good fireworks display on Hayman Island. It was calm during the night, but at 0030 the mooring buoy bumped the hull and bridge deck again so we got up and shortened the line. These really are badly designed buoys! We get up at 0805 and Michael and Ian take Veto to shore, it is a bit hard to get in as there is lots of coral in the shallows. We have breakfast and at 0920 we leave the mooring. We motor the short distance to Langford Island. 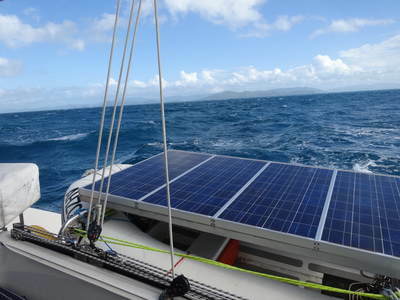 However, by the time we get there the wind has increased to 25 knots and it is not the best spot to moor. We had planned to scuba dive here, but in this wind it is not great. 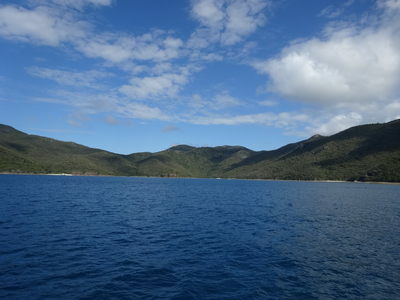 We decide to move and motor over to Blue Pearl Bay on the north-western side of Hayman Island. This is only just over four nautical miles from Stonehaven Anchorage. It is still as windy here, but there is a bit more protection. 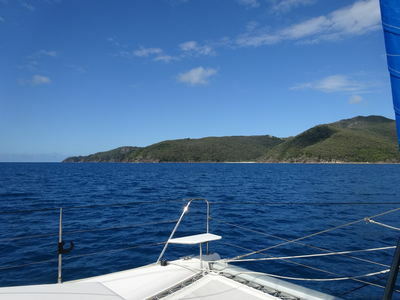 We take a mooring at the northern end of the bay. Ian and Michael go for a scuba dive. Before they do, they go for a run in Thunderbird 2 to check out the reef. They also take Veto to shore for a run (the beach is 100% coral pieces). Kelly decides not to dive and instead stays on the boat and will go for a snorkel later. Kelly takes them over in Thunderbird 2 to the small boat entrance to the beach (marked with red and green poles). Once in the water they descend into the channel and then head out to the reef edge. The depth starts off at 12 metres and increases to 15 as they head north. There is a lot of fishlife, including a large barracuda, some big sweetlips and lots of smaller tropical species. The coral is also very good, with many different species. After 20 minutes they turn around and come back shallower at about 7 to 8 metres. There is even more fishlife here. They see some nice nudibranchs, a quite rare harlequin sweetlips (certainly for here) and some anemones and small clams. They spend the last 10 minutes in five metres of water, there is lots to see here. All in all, a very nice dive. Kelly comes and collects them from the beach. After lunch, Michael takes Kelly and Sharon to the beach for a snorkel. He stays on the beach with Veto while they have a look around. While on the beach he meets some workers from Hayman Island who tell him that the fireworks display last night was for the first anniversary of the reopening of the resort after the cyclone. Later a boat called Wings comes in and moors in front of us. They have over 20 people on board. They send out some divers and then everyone else goes for a snorkel. Later, their dinghy comes alongside and drops off one of their passengers to us. Turns out it is Kellie Oldfield who used to work for Abyss Diving in Sydney and now owns Bilikiki Cruises in the Solomon Islands. She has been friends with Michael for about 15 years and saw that we were anchored here via our Facebook pages. She comes on board for a while till the boat is ready to leave. 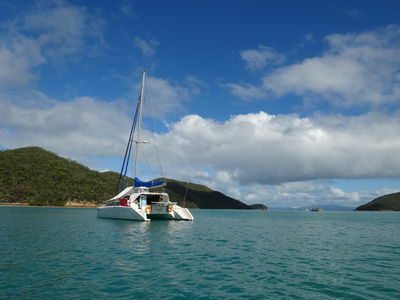 The boat is doing a three day, two night cruise around the Whitsundays. We have sundowners and then pumpkin gnocchi made by Kelly. 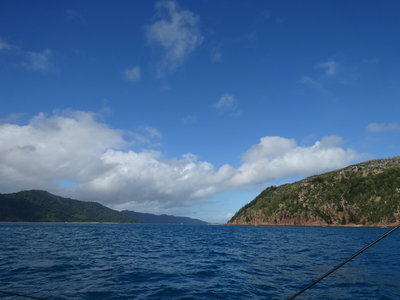 The anchorage is fairly calm, with little wind, but we have a bit of beam on swell every now and then. Today has been a very nice day, sunny, (perhaps a bit too windy) and with some great diving and snorkelling. 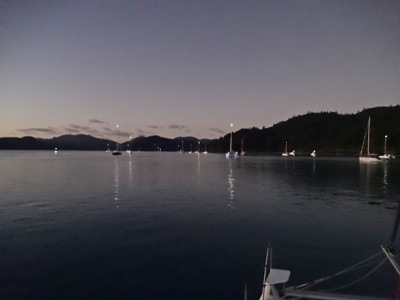 It was calm most of the night apart from 0315 when the mooring buoy started banging on the hull on and off for an hour. We get up at 0800 and Michael and Ian take Veto to shore. We have breakfast and two large charter yachts come in with many passengers for an early snorkel. 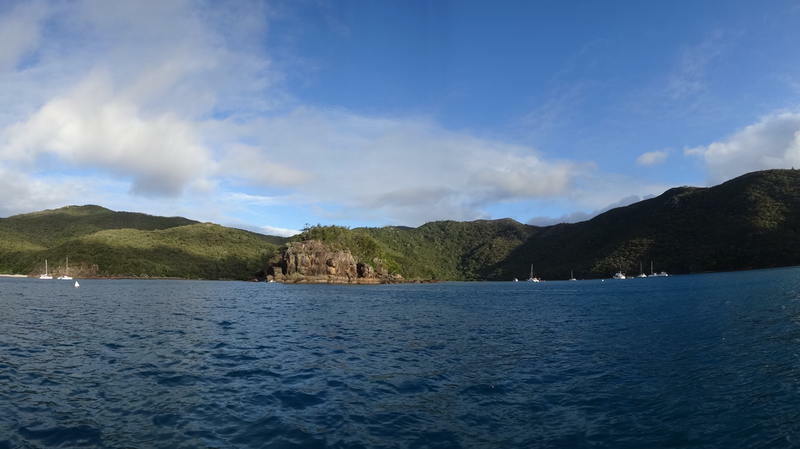 We leave the mooring at 0935 and motor around the top of Hayman Island. There is a 2 to 2.5 knot current behind us for most of the trip. We have to motor all the way as the wind is right on the nose. 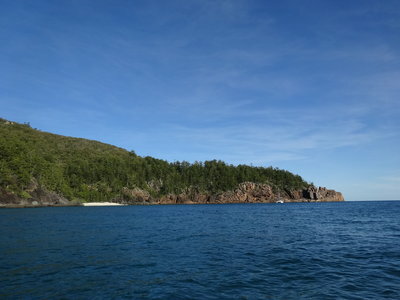 We go into Butterfly Bay at on the northern side of Hook Island. This has one long bay and a smaller bay. 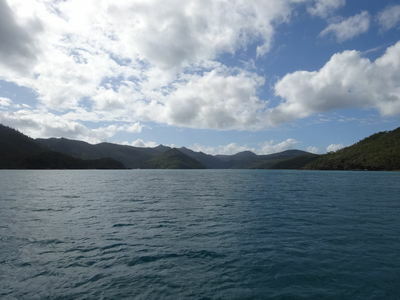 The long bay has quite high hills on both sides. We get a mooring in the long part of the bay, there were four empty here and three in the other bay. We are moored by 1030. We go to the beach for a quick look, this beach is very nice sand and is accessible at all tides. Ian, Kelly and Michael set up their dive gear and load it into Thunderbird 2. 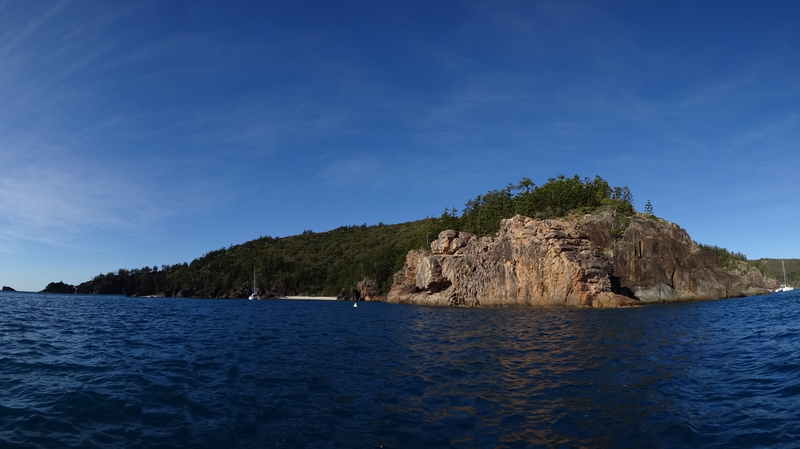 We motor over to the entrance to the long bay and anchor in a dead coral section. We do an almost 60 minute dive, with some very nice coral, lots of tropical species including a school of trevally attacking some small clear fish and triggerfish and surgeonfish. The visibility was also not too bad, about 15 metres. Back on the boat, we have lunch and then Kelly and Sharon go to shore with Veto while Ian and Michael fill the scuba tanks. After reading on the bow, very nice in the late afternoon sun, Michael and Ian take Veto to shore again for a last run. 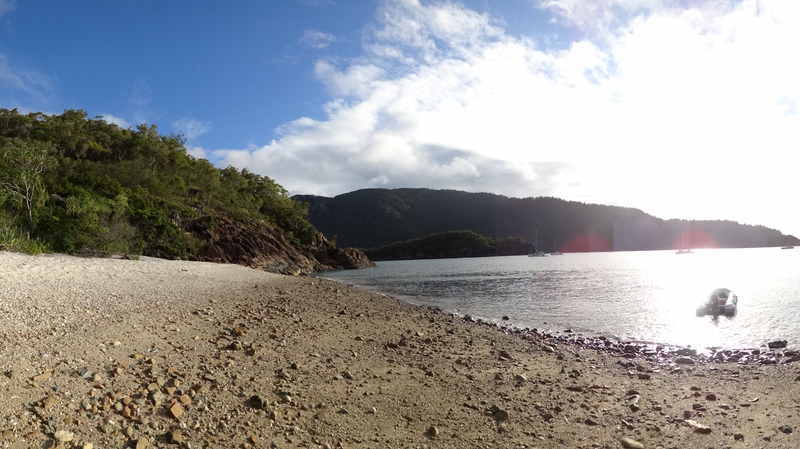 This time they go to the beach in the smaller bay which is composed of broken coral. Here they walk up the creek bed to a very small waterfall. There are thousands of butterflies here, they all launch themselves off the tree branches. Back at Catlypso we have showers and then sundowners. Michael cooks a barbecue of steak and sausages and Kelly does a pasta dish and a beetroot salad. There is also a bit of rain around, both before and after dinner. A very nice day indeed. It was even calmer overnight than last night. We once again get up at 0800 and Michael and Ian take Veto to the beach. We have breakfast and then leave the mooring at 0925 and motor to Manta Ray Bay but both moorings are taken. 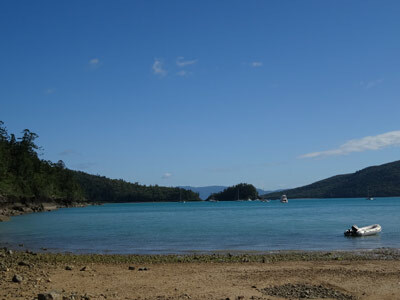 We go around to Pinnacle Bay, but again the only moorings are taken. 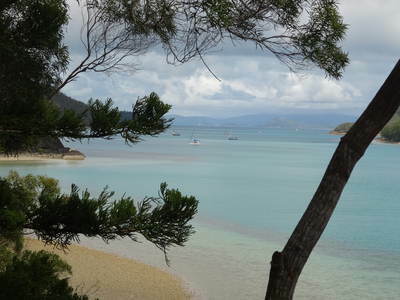 We go back to Luncheon Bay which is the next bay to the west. We get the westernmost mooring at 1010. Once again Sharon is going to stay on Catlypso while the rest of us go diving. We gear up and put it all on Thunderbird 2. 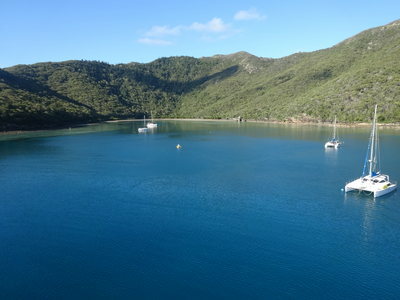 We motor around to Manta Ray Bay and get one of the smaller tender moorings before three large charter boats turn up. We get in the water but Kelly has some gear problems. The face of her regulator second stage has fallen off and one plastic ring has sunk to the bottom. Michael goes down and gets it. He puts the reg back together and it appears okay. However, Kelly decides to dive using her ocky (back up reg) but when she takes a breath, all she gets is water. She uses Michael's ocky to get back to the surface. She decides to use the repaired second stage and all goes well. We head north to the reef edge and then west along the edge. The reef has lots of large coral bomboras (bommies) and out deeper some smaller ones. The depth gets to almost 18 metres, although we certainly could have gone deeper. There are some nice canyons between a few bommies and also some overhangs. The fishlife is quite prolific, with lots of species. There are also quite a few species of nudibranchs and a small flatworm. We come back into the shallows near the mooring and see a huge Maori wrasse. We spend the rest of the time here. When we surface, the big boats are all gone. We motor back to Catlypso. 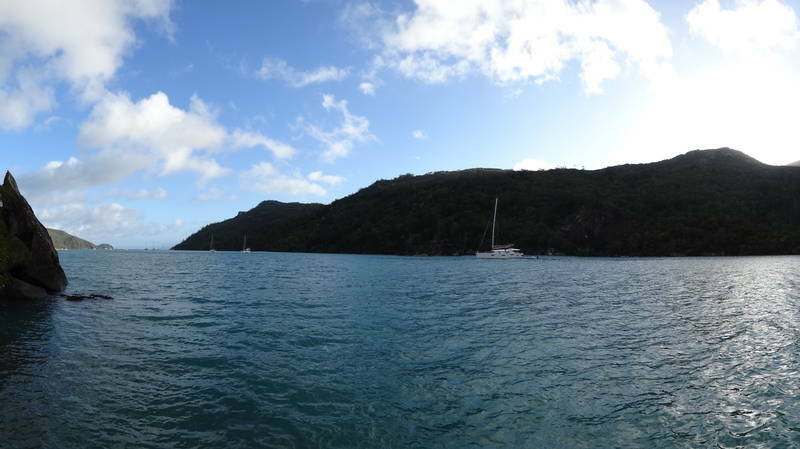 Once back on board, we leave the mooring and motor back to Butterfly Bay. We get the last mooring at 1255. We have lunch and then Kelly and Sharon take Veto to the beach again while Michael and Ian run the compressor (it is noisy) and fill the tanks. Kelly later comes and collect Michael and Ian and they go back to the beach. The sun sets early on the beach, about 1545. It gets a bit cool, so we go back to Catlypso. Michael adds fuel to Thunderbird 2 (12 litres) and the main diesel tank (38 litres) so we can fill the containers up tomorrow. 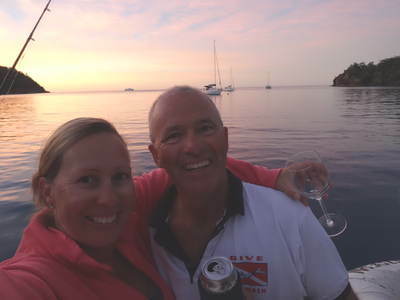 We put all the dive gear away and then have sundowners. Kelly is cooking lasagne tonight so she works on this. We have sundowners and then dinner. It was calm overnight but at 0000 the mooring buoy started banging on the hull so Kelly, Michael and Ian got up and shortened the bridle. We get up at 0800 and Michael and Ian take Veto to shore, the water is so much clearer than previous days, we can see the bottom at our mooring. Michael goes up the mast to fix the navigation tricolor light that he stuffed up before. He takes up a file and once there, he files off an end of one of the lugs where the light cover screws into the base. This time when he inserts it, it goes in facing the front. Kelly turns on the anchor and navigation lights and they both work. Brilliant, it has only taken a year to fix! We have breakfast and at 0930 we leave the mooring. We pull up the main and the screecher and with 8 knots behind and one engine at 2200 rpm we are doing 5.3 knots. 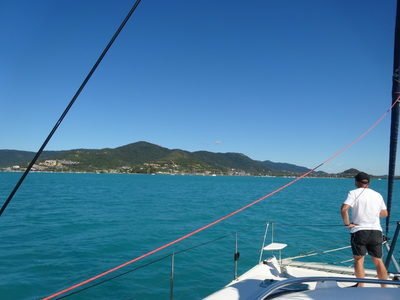 As we round the top of Hayman Island the wind picks up and we are doing 8 knots. It then promptly dies. 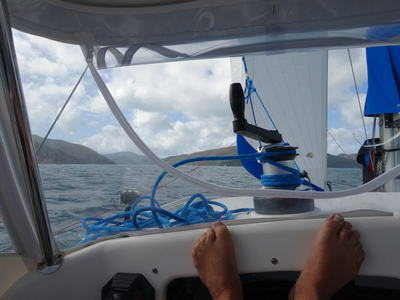 We end up mostly motorsailing to Airlie Beach, doing 6.5 to 7.0 with one engine at 2000 rpm. We are doing this so we can get there at a reasonable time as Ian and Sharon are leaving us today we want them to be able to get away early enough so they can drive a bit south. It is a good sail across. 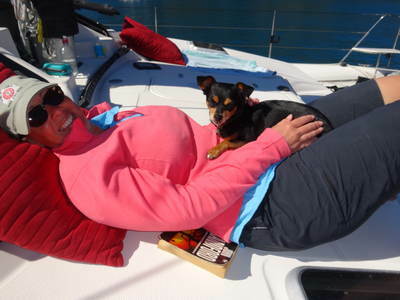 Kelly phones the Abel Point Marina and books two nights. This is a very expensive place, $128 a night. We come in and by 1330 we are moored in a berth. The service from the concierge who met us is good, but it still does not justify the price considering it is almost twice as expensive as Rosslyn Bay. Ian heads off to walk to get his car from the caravan park where he left it while we tidy everything up. When he arrives back, he takes Michael to Cannonvale to get fuel. He purchases 88 litres of diesel and 38 litres of petrol. Ian and Sharon head off at 1500. We go to the laundry and put on three loads of washing. 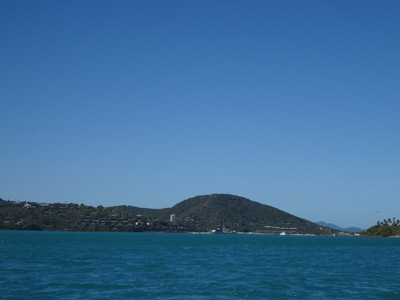 We then walk to Airlie Beach to check out the shops and restaurants. It takes 15 minutes to get to the centre of the shopping area. There is a Woolworths and a BWS grog shop, quite a few pubs but not many restaurants, we cannot find a Chinese, Thai or Vietnamese (there was one but appears closed). When we get back we put the clothes in the dryer and Michael puts the fuel away. He also flushes the watermaker. Meanwhile, Kelly washes our wetsuits, BCDs and regulators. Michael then pulls apart the ocky on Kelly's diving regulator and discovers the problem from yesterday. The diaphragm has pulled out meaning there was no seal. It is easily fixed. After long and luxurious showers, we go to the restaurant at the marina (we are on the northern section). This has pizzas which is what we want to eat tonight, it has been about 10 weeks since we have had one. They have excellent wood-fired pizzas and fairly cheap beer for a restaurant. We also phoned our family who we have not been able to contact for five days. We are in bed by 2035, an early night. It of course was calm overnight and no wind. We get up at 0800 and put on another two loads of washing and then two more once the first are finished (all the washers were in use). After breakfast Michael asks the chandlers about a solar regulator and blades for the wind generator. He will get a price for the blades. He also asks the electrical shop and they have a regulator for $110. 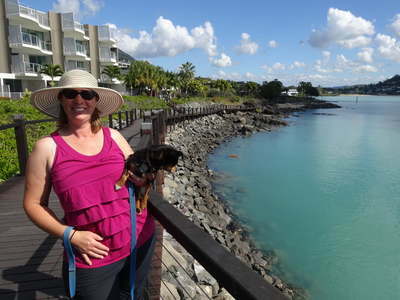 We walk again to Airlie Beach, this time to get some beer and wine. We have our little trolley and a backpack to bring the items back. We have booked the marina's courtesy car for 0830 tomorrow as all today's spots were already taken yesterday. More about this later. We have morning tea at a cafe (great scones, jam and cream). We get a couple of cartons of beer, four wine casks, two casks of port and three bottles of sparkling wine. We have a few birthdays coming up! The trolley handles the weight of the beer and wine okay, but the casks tend to slide off at times. All in all, it was not too hard. When we get back the washing is dry. When we get back there are two new neighbours, a Seawind called About Time from Melbourne and a monohull from Brisbane (who broke their steering as they went to cross Wide Bay Bar!). We chat to them for a while and then put our drinks away. 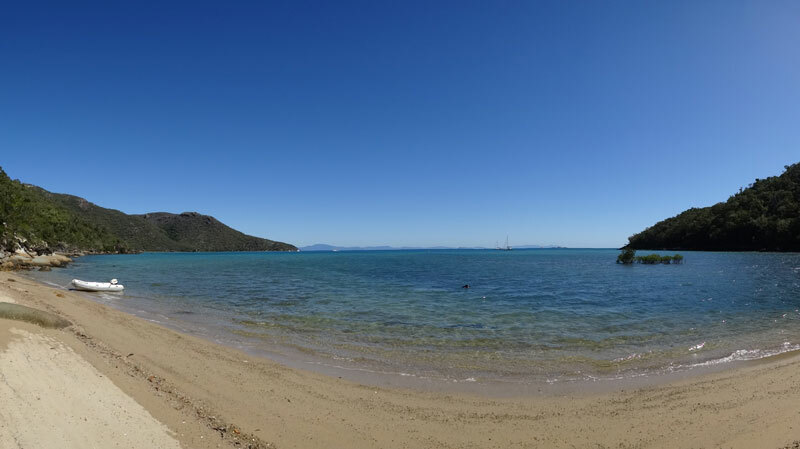 We decide to walk to Cannonvale which is in the opposite direction to Airlie Beach. This takes 20 minutes. There are brilliant boardwalks and paths from the marina to both centres. 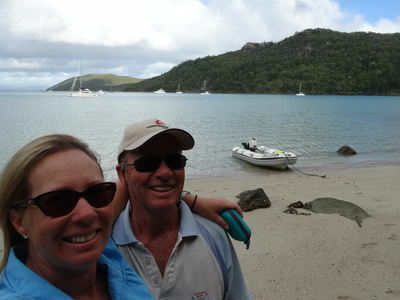 We have also seen Craig and Julie from Saltwater Dreaming today and yesterday. 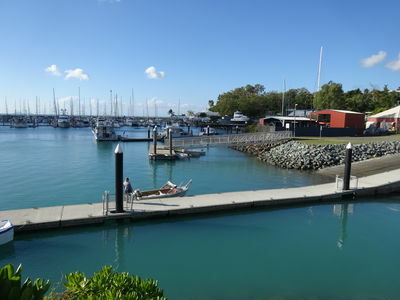 They are anchored off the southern end of the marina and tell us you can easily dinghy in to visit the shopping centre at Cannonvale which is only a couple of minutes walk from the boat ramp. We buy some meat and a container to wash the watermaker filters in. We also have a pie for lunch. This shopping centre also has two grog shops, a petrol station (where Ian brought Michael yesterday) and a Coles supermarket. On the way back Michael stops into another marine electrical place and the places he visited in the morning. There is no luck with the blades, they all report that they cannot get Air-X blades but they can get another brand for almost $500. He declines, but gets the regulator. Kelly discovers this afternoon that the marina courtesy car has no insurance. They claim that they cannot get it insured. Personally we do not believe this as other marinas have cars that are insured. As they are not hiring them out, they do not need to be registered or insured as a rental car or taxi as claimed. Kelly tries to order our food from Woolworths on-line but has no luck. We decide that we will walk to Airlie tomorrow and use our trolley and backpack to get what we need. Michael has another look at wind generator blades on eBay and finds some from Canada. He orders them (not OEM) and a nose cone, delivered to here for AU$270. He makes arrangements for the marina to hold and we will return in about a week to collect. 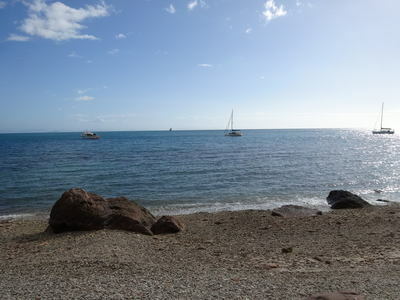 After showers we walk to Airlie Beach again. We look for a Chinese restaurant again but find none. We end up going to Mangrove Jacks, a pub at the southern/eastern end of town. We have an excellent dinner, Michael has pork spare ribs and Kelly barramundi. It is also the third and deciding game in the State of Origin (NSW versus Queensland). We watch it, NSW is whopped 50 to 6. Queensland regains the trophy they lost last year for the first time for years. We walk home and a very relieved Veto greets us. During the night the wind picked up as forecast but it is hard to tell in the marina how windy it is. During the night, probably about 0300, Veto vomited on the bed. Well, not actually on it, in it. She was at our feet between the doona and sheet. Michael felt a wetness on his feet. We had to pull the doona cover and sheet off. Today we get up early as we now have to wash the sheets and doona cover again before we leave. We put do this and then walk to Airlie and do our shopping at Woolworths. We do not have to do a huge shop like Yeppoon, so we can easily carry it all back. We put two bags (from Ikea) on the trolley and the rest in the backpack. It is quite an easy task. We put everything away, dispose of the packaging from some of the items. We check out and reverse out of the berth easily at 1115. Once outside we try the genoa but there is not enough wind. We pull out the screecher and are doing 7 to 8 knots a bit later, with much faster bursts at times. As we approach Pioneer Rocks the wind increases to a constant 25 to 26 knots on the beam. We are now going too fast so we pull in the screecher and pull back out the genoa. We are doing 3.5 to 4.0 knots (we are now close hauled) and later even faster (5.5 to 6.5 knots) when the wind again is on our beam. The seas are very choppy. At 1345 we pull in the genoa and motor into Nara Inlet. 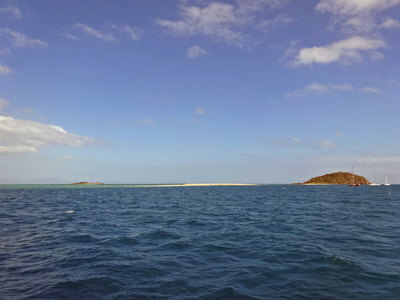 This is on the southern side of Hook Island and is a very long bay. We motor to the end and anchor about a nautical mile from the head of the bay in 6.3 metres about 0.7 metres above low tide. This is a very nice spot, the wind is only five knots or so and only a very slight roll from the south. When we get there we only have about nine other boats. By 1700 there are almost 30 boats here, but it could hold another 50 easily. We have lunch and then Michael finishes the installation of the solar panel regulator and checks that it is working. At 1615 we take Veto to shore. There is no beach at the moment as the tide is too high. We find a level rock where we can pull up alongside. However, it has very sharp rocks on it and we have forgotten to put our thongs back on Thunderbird 2. Veto has a quick run around. 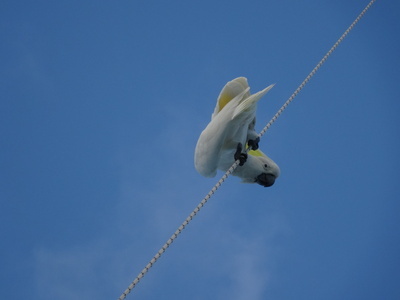 Back on Catlypso we have some visitors, two sulphur crested cockatoos which land on the back stay and the main stays. Michael shoos then away, we do not need them chewing any part of our boat. We have showers and then sundowners. Kelly cooks a creamy pasta for dinner. It was calm during the night apart from one gust very early in the morning and a touch of rain. We get up at 0815 and have breakfast. The tide is too high to take Veto to shore yet, we need it to drop enough to see the beach. 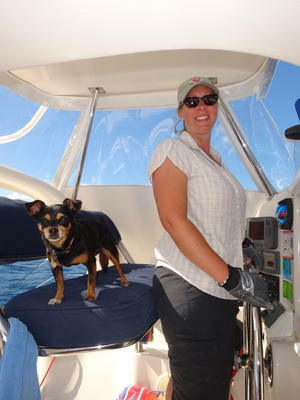 After this Kelly did some cleaning of the boat while Michael adjusted the lines from the davit to the tender. This has gradually altered so that the stern of Thunderbird 2 now hangs down a bit compared to the bow. However, it later turns out he was not successful and will need to do it again tomorrow. Michael then phoned the Roads and Maritime Services in NSW. It took 20 minutes for them to get to his call! He had forgotten that his driver's licence expires next week. The problem is it can really only be renewed at an RMS Office (or Service NSW as some are now called). He finds out that there is a form he can download, complete and post off with a photo that will temporarily extend his licence. He will download the form tonight and when we go back to Airlie Beach in a week or so, print it out, get a photo taken, and mail it off. He was so hot after waiting this long for them to take the call (he was sitting at the helm as it has the best reception here) he jumped in the water for a swim. We then sunbake and read for a while before heading to the Ngaro Cultural Site. 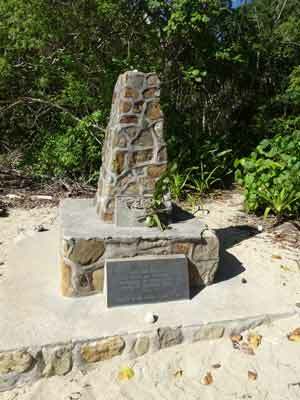 This Aboriginal site is located near the head of the bay. 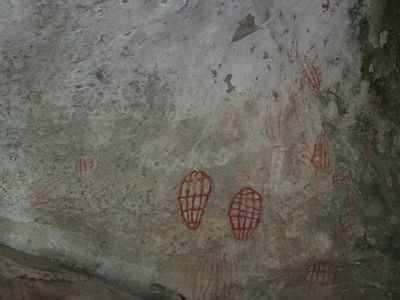 It is a short walk from the water to the cave where there are some very nice paintings. These are different to any we have seen elsewhere in Australia. Well worth visiting if you are in Nara Inlet. Back at Catlypso we have lunch and put up the sun shade on the bow. It is really warm as there is little wind. We later take Veto to shore again as the tide is low and there is now a bit of beach for her to have a good run around. She also has a swim and rolls in the sand a lot. When we get back on the boat we give her a bath, the first she has had in six weeks (apart from swims). We read for the rest of the afternoon. Later a charter yacht comes in and anchors in front of us. We hear them on the radio, this is their first night out. When Michael takes Veto to shore again, he invites them over for sundowners. They later come over, Wayne and Shannon and their daughter Olivia from Melbourne (although Shannon is originally from Texas). They spend 90 minutes with us and we realise that Wayne has investigated some bushfires that Michael has been involved in and they know some of the same people. After they leave we have massaman beef curry and rice. It was calm again overnight and we get up at 0710 as we want to leave early. 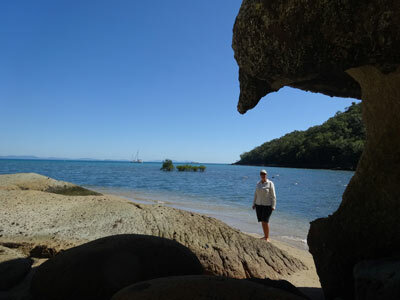 Michael takes Veto to the rock her took her to last night as the tide is so high all the beaches have disappeared. On the way back he stops at Lazyitis to tell them about the Aboriginal painting site up the bay. After breakfast, Michael again attempts to adjust the davit lines for Thunderbird 2, this time he seems to have done a better job. At 0830 we pull up anchor, it takes a while as Kelly has to wash off all the mud from the chain and anchor as it is raised. We motor out of Nara Inlet and once outside pull up the main and the screecher. There is little wind and we are only doing 3.5 knots. 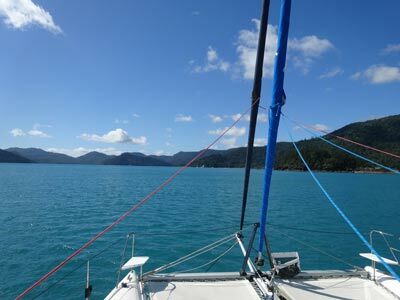 We want a bit more speed as we want to get to Blue Pearl Bay as early as we can as the moorings go pretty early from what we can see (and it is too deep to anchor). We decide to pull in the screecher and use the spinnaker. However, as we hoist it the halyard clip comes undone and it falls back down. This is not a problem, but the fact that the halyard is now half way up the mast and tangled. We pull out the screecher again and end up pulling down the main as it is blocking wind to the screecher. We go faster without it, but still only doing 4.1 knots in a following wind of 8 knots. Most of this is current from the tide. 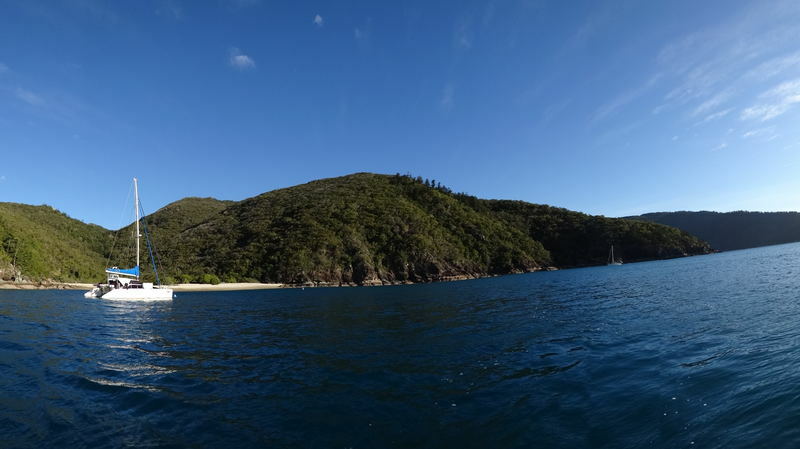 We arrive at Blue Pearl Bay on the north-western corner of Hayman Island at 1110 and get the southern most mooring next to Island Home. We have not seen them for about two weeks and they now have some friends aboard. Geoff stops off as he is going for a hooka dive. We gear up and take Thunderbird 2 about 50 metres to the reef edge and anchor. We do a dive here, it is not too bad, probably not as good a site as the dive to the north of here last week. We head north and end up at the small channel which goes onto the beach. We come back to Thunderbird 2 and end the dive in the shallows. We see a huge anemone with only two small pink anenomefish (clownfish) and two three spot dascyllus living in it. We also see many butterflyfish, some coralfish, a batfish, a barracuda (not sure about this one, it was not like normal barracuda) and a nice nudibranch. There is plenty of species of coral, both hard and soft, and one of the longest seawhips we have ever seen. Visibility was very good, about 20 metres. When we get back to Catlypso, a boat comes alongside asking if we can leave the mooring for 15 minutes so they can service it. We tell them that we are leaving anyway if they can wait a few minutes. Good to see that the moorings get serviced (we saw a new one at Manta Ray Bay the other day). We motor over to Island Home and have another chat before heading for Butterfly Bay. We have to motor all the way as there is no wind at all (well, less than 5 knots and it is on the nose anyway). We get a mooring at 1410, there are only a few boats here. 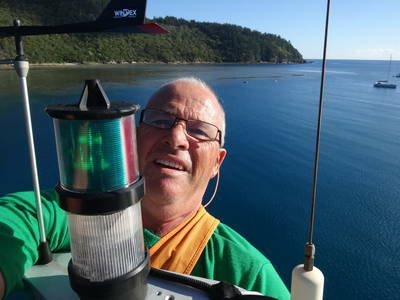 As soon as we are moored, Michael goes up the mast and retrieves the spinnaker halyard. We have lunch and then Michael takes Veto to the beach. Kelly tidies up the sails and then Michael puts the compressor on to fill the scuba tanks. Not long after this Walkabout comes in and Wayne and Jillian come over to say hello. We later take Veto to the beach for a good run and they kayak over as well. 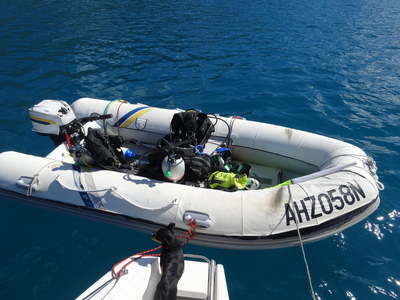 Once back on board we pack away all the dive gear and have hot showers. We have sundowners and then some Asian entree food that we bought, samosas, spring rolls and money bags. We have some strawberries, so Michael puts together a plate with them, pineapple and chocolate. Nice with a port. Today was probably the best weather of the trip, with sunny skies all day, millpond seas and only light winds (not good for sailing of course). The original forecast for last night was for strong northerly or north-easterly winds and then a 25 knot south-westerly change later in the morning. Yesterday this changed to only 20 knots. Well, last night it was basically calm, with some wind from the north, then from the south-west, then from the north and again from the south-west. It seems the forecast was way out. The anchor alarm went off quite a few times as we turned 180 degrees many times. Normally this would not set it off, but these moorings have such a long rope that we move perhaps 40 or 50 metres with each change. We get up at 0820 and Michael takes Veto to the beach. We have breakfast and then get our dive gear ready for a dive. We head off in Thunderbird 2 at 1030 and motor out past where we dived last week. We drop anchor off the reef in 10 metres. 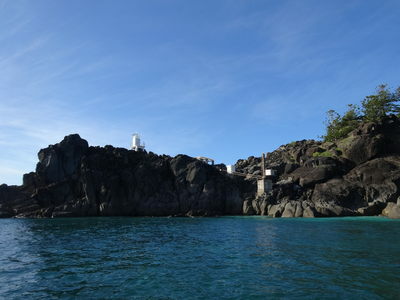 We do a 50 plus minute dive, the reef here has lots of coral bommies and a few walls. This is a better site than last week's one, but as the tide is going out the visibility is not great in spots. We see another juvenile harlequin sweetlips, a few nudibranchs, a swimming flatworm and a couple of nice barramundi cod. 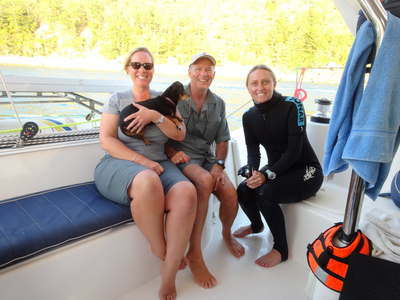 We can hear humpback whales throughout the dive, just like yesterday. We actually hear later on the VHF that they are leaping out of the water about 10 nautical miles to the north-east of us. Anyway, it is a nice dive. Back on Thunderbird 2 we see a huge superyacht called Tango come in and anchor about 100 metres north of where we dived. We motor over to the headland to check out the reef there. It is a lot closer to the shore here, we might dive this spot later in the week. After lunch, Kelly takes Veto to shore while Michael fills the tanks and dries the rest of the gear. When she comes back, we read for a while till Lazyitis comes in. Wayne brings Olivia over to say hello to Veto. We later go to the beach and they come over and Olivia tires Veto totally out. The last spot in the bay is not taken till about 1630, amazing, just shows what happens when school holidays end as they do today. 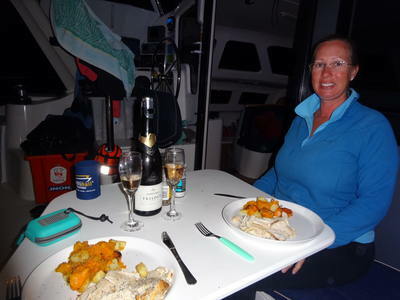 Back on Catlypso we pack away the dive gear, have sundowners and then Kelly cooks curried sausages and rice. A simple but great meal. Last night was mostly calm but at times the wind blew strong (20 knots or so) from the south or south-west. However, it was still comfortable during these times. It is cool, the coldest morning for over two weeks. There is snow through large parts of NSW and southern Queensland! We get up at 0700 and Michael takes Veto to the beach. 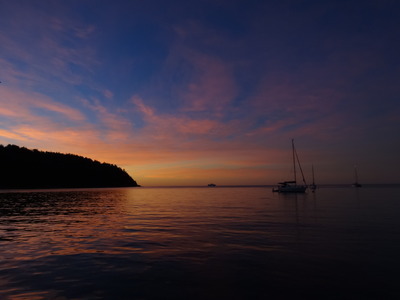 We make coffee/tea and head off at 0725 as we want to get a mooring at Manta Ray Bay. It is not far to motor, just over two nautical miles. However, as we approach, the second of the two moorings is taken by a yacht that has come out of Luncheon Bay a few minutes before we pass by. We motor on around to Pinnacle Bay and at 0800 we take one of the moorings there. It is a bit rougher here, with a definite current from the east. Of interest, our chartplotter (which uses Navionics charts) shows us anchored in the headland rather than on the water. 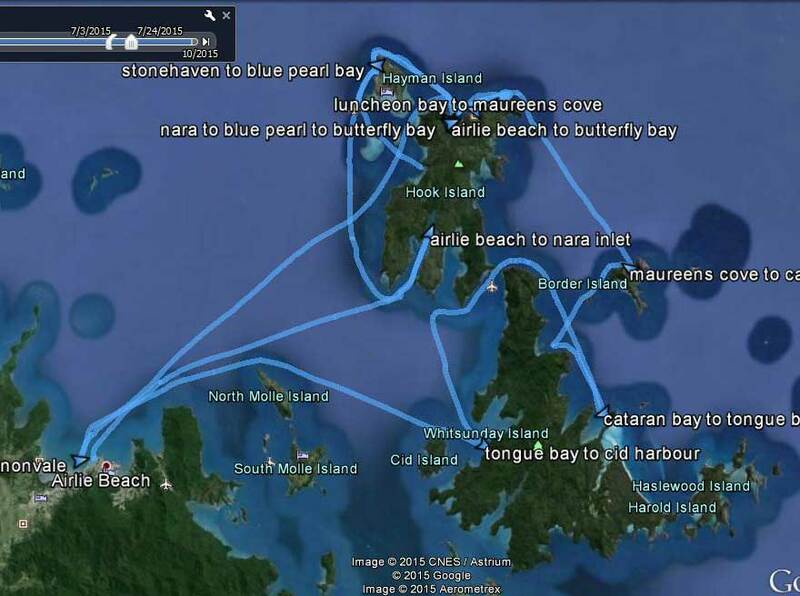 This is the third location where it has been very inaccurate (Lady Musgrave Island and Pancake Creek were the others). Soon after we arrive we take Thunderbird 2 for a run to see if the first boat in Manta Ray Bay is still there. 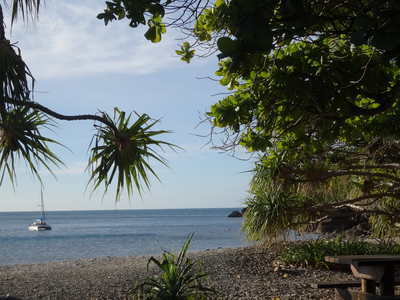 It is, so we have a look at the reef around the bay in case we end up diving here. There is a small lighthouse on Pinnacle Point which has an interesting gantry for unloading things from boats. Yesterday Kelly complained that the steering in Thunderbird 2 was very hard. Sure enough, it seems to have got a lot worse, but as Michael mostly drives it and the change has been (presumably) gradual, he has not noticed it till now. He greases the outboard steering assembly as well as the tilting arm. Wow, what a difference, how did he not notice this before? At 0915 Michael goes for a run in Thunderbird 2 to see if one of the boats in Manta Ray Bay has left. He comes back very quickly as the boat we saw take the mooring just before 0800 has left. We quickly secure Thunderbird 2 to the side of Catlypso, discard the mooring and motor around. A few minutes later we are moored on the eastern mooring. We set up our dive gear and load into Thunderbird 2. As it turns out, we could have dived straight off Catlypso and down the mooring as it is right on the main part of the deeper section of reef (15 metres or so). 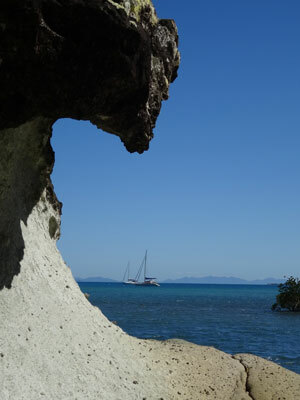 We motor over to the main reef and drop anchor in a section of dead coral. We dive out to the deeper section of the slope (it goes down well over 30 metres we think) and then turn to the north. All along this part of the reef there are lots of small coral bommies on a sandy slope and we swim along at about 18 metres. The visibility is at least 20 metres and there are lots of fish to see. The current is all over the place, sometimes behind us, sometimes into our faces and at other times across us. We come back at 15 metres where there are some larger bommies and sometimes some small walls of coral. We come back and pass where we anchored Thunderbird 2 and then see Catlypso above us. It is here that we see the mooring. If we dive here again we will definitely come down the mooring. We head south till we come to where we turned around the last time we dived this area. We end up spending the last 10 minutes doing a safety stop in five metres. We see lots on this dive, including a huge giant trevally under Catlypso, an enormous bullray, some nice nudibranchs, a few large anemones with pink anemonefish and heaps of gorgonias. The gorgonias are the first we have seen here. This was a very nice dive, we spent almost an hour in the water. 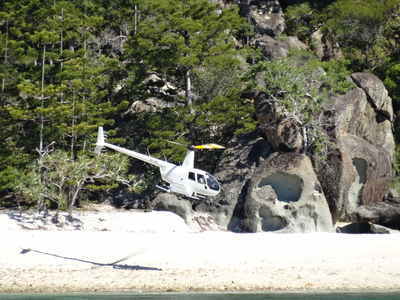 After we get back on Catlypso and haul all the dive gear out of Thunderbird 2, we motor around to Luncheon Bay. Here we get a mooring, it is only 1150. We lay out our dive gear to dry and we see a power boat coming in. Too late we realise that it is Chilli Bella which is owned by my brother Stephen's brother-in-law. You will recall that they spent some time with us about two weeks ago. They see there is no mooring and turn around and head away. Michael tries to call them on the VHF but they do not answer. He later takes Thunderbird 2 and heads to the next bay to see if they are there, but they must have headed to Butterfly Bay or somewhere else. Hopefully we will catch up with them tomorrow. There is a helicopter on the main beach and obviously some passengers are wandering around somewhere. About 45 minutes after we arrive the chopper starts up and then departs. Nice to have some money! Heaps of boats come in over the next couple of hours, including four huge racing yachts which now operate as tourist boats (most are ex-Sydney Hobart racers), a huge power catamaran and a sailing catamaran and a large dive boat. These appear to do one or two night cruises out to the islands, with snorkelling and diving included. The dive boat does not actually carry passengers, it gets its customers from the other boats. 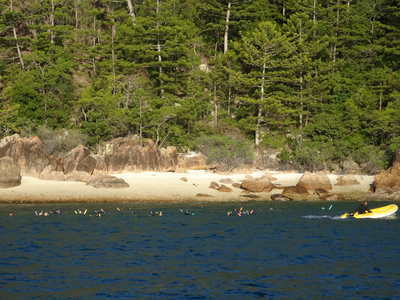 Soon the beach and the reef is crowded with snorkelers. We decide to stay on Catlypso and later put the compressor on and fill our tanks. After most of these boats depart, we take Veto to the beach which is composed of large coral pieces. This is the middle beach which is more attractive. 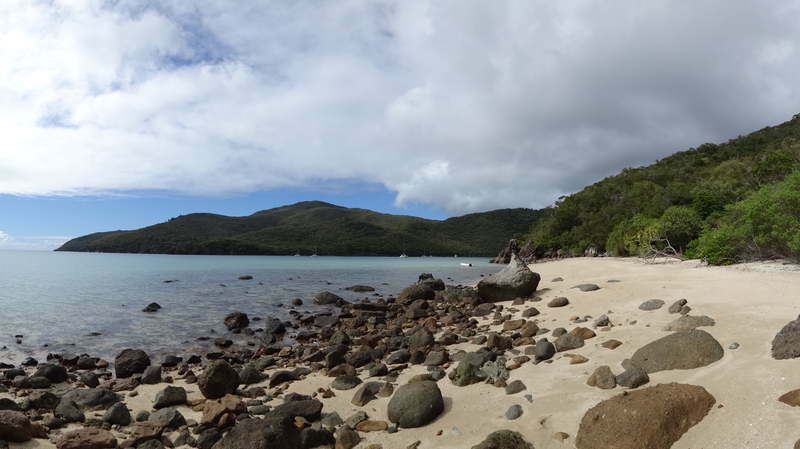 There are four Danes here who are kayaking, they have come from Whitehaven Beach to Maureens Cove (the next bay) and are camped there. As it starts to get darker, we head back and have showers and sundowners. At about 1745 we notice that we are hanging in the opposite direction to every other boat. We investigate and discover that the mooring line appears to be caught on our port prop. We try using the boat hook to dislodge it but this fails. We then take off the mooring line from our bridle and drag it back to the stern. Using the boat hook, Michael eventually frees the line from the prop and then from the rudder. We then drag it over to the starboard side and then back to the bow where we reattach it. We also shorten the line. As we have previously stated, the moorings here are stupid, with huge lengths of free rope from the buoy. In this case, there was over 11 metres of rope from the buoy to the end of the mooring. We have heard on the radio at least two other boats who have got the mooring line tangled on their prop or rudder. We finish sundowners and then have tacos for dinner. A nice day, despite the problem with the mooring at the end. 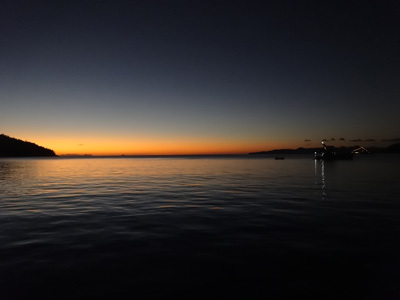 It was calm overnight and at 0400 Michael saw the P&O cruise liner, Pacific Jewel (which we went on 18 months ago with Michael's Mum) pass by to the north of us on the way to North Molle Island. Michael gets up at 0800 and puts on the watermaker as it is five days since it was flushed. We get up at 0820 and Michael takes Veto to the beach which is almost non-existent at high tide. Once back we have breakfast. We were going to go to Cataran Bay on Border Island today, but this morning nearly every charter boat has said they are going there for lunch or to stay the night. As there are very limited moorings and it is pretty deep to anchor, we decide to change our plan. 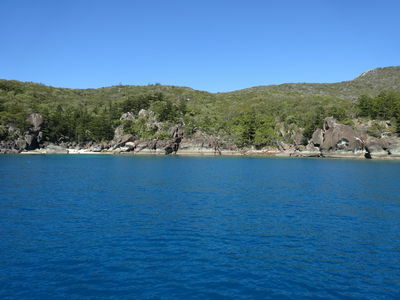 After a bit of thought, we decide to dive here at Luncheon Bay and then go around to Maureens Cove and stay the rest of the day and night there. Tomorrow we will go to Cataran Bay. After breakfast we set up our dive gear. However, just before we get in Thunderbird 2 to motor over to the dinghy mooring to start the dive, a large aluminium power cat comes into the bay and straight at us. Michael guesses that it is the Marine Parks boat and he is right. They advise us that they have a report that the mooring we are on has a damaged rope. This is correct as we noticed this last night when we were untangling the rope from our prop. Michael also tells them how hopelessly designed the moorings are, but the marine parks bloke seems to think they are good (how can over 11 metres of free rope from the buoy be good?). Anyway, they want us to move off the mooring for five minutes so they can fix it. We advise that we will move the vacant mooring two down which a boat just left. We move and get the new mooring. We must admit, if they did fix it, they did it quickly as they left within 10 minutes. We motor over to the dinghy mooring and tie up. We start the dive from here. It is just over 14 metres at the bottom and we are on a slight sandy slope with some small isolated coral bommies. We head north following the main part of the reef, staying between, 13 and 16 metres. There is a slight current behind us and at 17 minutes we turn around and come back at 12 metre or so. We see a couple of very large Maori (or humpheaded) wrasse in this area. We have also seen a few different species of nudibranch. We drift back around some larger bommies before going back to the 14 metre level to refind the mooring. We find it and then spend some time to the south, east and north of the mooring before coming back again. 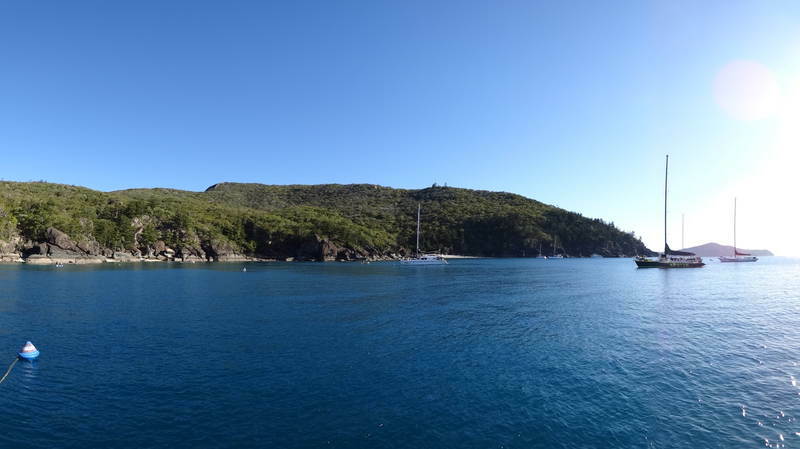 As we approach the mooring, we see a large white-tipped reef shark swimming by the mooring. This is the first shark we have seen at the Whitsundays. We do another round before ascending the mooring. We do a safety stop and then ascend. The visibility has not been great, perhaps only 10 metres and even less on the safety stop. 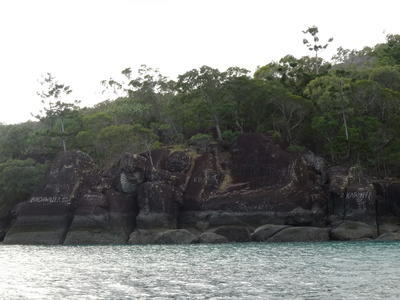 Once back on Catlypso, we are soon motoring to Maureens Cove, the next bay south-west. 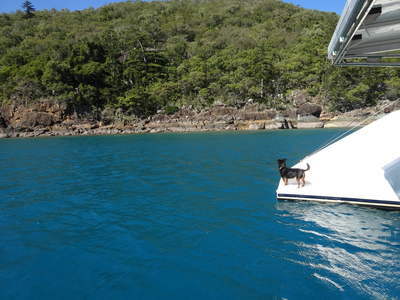 The only mooring is one that is supposed to be for cats of 9 metres or less, but we grab it. Later Michael checks with the boat near us and they say they are leaving at 1400 so we will move there. However, the power cat to the north of us leaves soon after and we move to that mooring (the moorings have different "grades", but the logic evades us as does the grading - it is on length rather than tonnage). Michael finally turns off the watermaker, having run it for almost five and a half hours and made about 110 litres of water. It is sunny today so the solar panels have supplied sufficient power to do this. We spend the rest of the afternoon here, some tourist boats come in with their backpacker clients, but this is a lot less crowded than other places we have been at over the past two weeks. Finally they all leave and there is just us and the yacht that said they were leaving (they didn't). We go to shore again, it is all coral pieces and very steep in parts. There is a camping area here, not too bad, with tables and a toilet. There were a few people camped here yesterday, but today there are none. Back on Catlypso we have showers, sundowners and Kelly prepares dinner for Michael's birthday. We have roast turkey roll with vegies and then apple strudel and double cream, all washed down with a bottle of very nice James Hardy Trilogy sparkling wine. An excellent dinner, impossible to beat even in a restaurant!